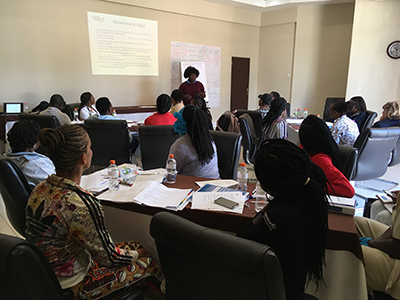 In May 2018, the WSLA team travelled to Gaborone, Botswana, and hosted a bespoke three-day WSLA programme for 37 women leaders from sporting organisations based in Botswana, Ivory Coast, Japan, Uganda, Zambia and Zimbabwe. 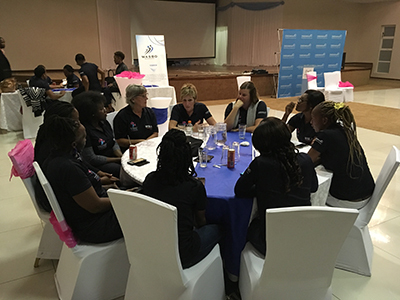 WSLA Botswana is a partnership between the University of Chichester and Women and Sport Botswana. It is a venture that preceded the World Conference on Women and Sport in Gaborone. The programme was led by Lucy and Pauline, who were joined by WSLA graduates that were trained as facilitators: Betty (WSLA 2016), Boitumelo (WSLA 2015), and Immaculate, Joan, and Zola (WSLA 2014). Tsosi Magang (WSLA 2016) was instrumental in bringing WSLA Botswana to fruition and with Lombe and Ellen Barwise (Commonwealth Games Federation), they formed the Support Facilitator team. Anita and Jordan joined on day two and also offered support and guidance. The programme mirrored elements of the residential week in the UK, though sessions were condensed for time and also made more appropriate for the African context. A Celebration Reception was hosted by the IWG and its co-Chair, Ruth Maphorisa, spoke to one hundred guests and media personnel in attendance. We would like to thank MASCOM, Debswana and the IWG for the tremendous support provided to the programme too. 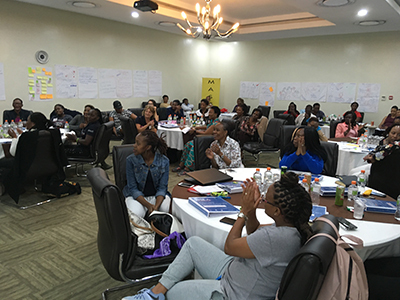 The 37 participants of WSLA Botswana and the 35 participants of WSLA 2018 have helped the WSLA graduate network grow to 228 women from 41 countries! WSLA Botswana was hosted in the Tlotlo Conference Centre in Gaborone. 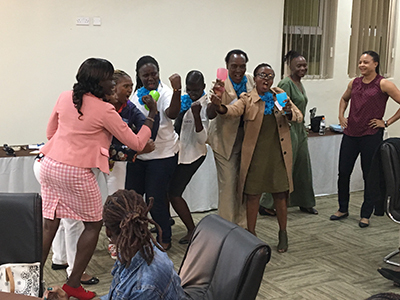 Here, the participants constructed goals to form part of their personal development plan that will guide their actions upon returning to their organisations. The programme consisted of workshops and breakout sessions, including presenting with style and impact, strategic thinking and networking, managing change and dealing with conflict. Lombe (pictured) leads a session on empowering women. The facilitator team at WSLA Botswana predominantly comprised graduates of the WSLA programme hosted at the University of Chichester. Two days of training was given before WSLA Botswana commenced. The WSLA Home Team competition is always well-contested and in Botswana it was no different with Zola and Joan’s team finishing victorious!